To make the point, I’ve compiled a list of unsolved problems in mathematics to match the topics covered in the common core. The problems are all well-known to mathematicians, and my only contribution is to select problems that (a) are of interest to research mathematicians (b) provide a good balance among the different areas of mathematics and (c) are understandable by students studying to (the highlighted) Common Core Standards. For each grade/high school topic, the header is a link to the Common Core Standards. Based on the standards, I have selected a single problem to associate to to the grade/topic (although it is worth noting there were always a large variety to choose from). For each problem, I begin by highlighting the relevant common core curriculum which the problem is related to, followed by a warm up exercise to help introduce students to the problem. The warm ups are exercises that should be solvable by students with knowledge of the Common Core Standards. I then state the unsolved problem, and finally I provide (in brief!) some math background, context and links for those who are interested in digging deeper into the questions. Disclaimer: it’s possible, though highly unlikely that any of the questions on the list will yield to “elementary” methods accessible to K–12 students. It is quite likely that many of the problems will remain unsolved in our lifetimes. So why bother introducing students to such problems? The point is that the questions reveal a sliver of the vast scope of mathematics, they provide many teachable moments and context for the mathematics that does constitute the common core, and (at least in my opinion) are fun to explore (for kids and adults alike). Perhaps most importantly, the unsolved problems and conjectures reveal that the mathematics taught in K–12 is right at the edge of our knowledge: we are always walking right along the precipice of mystery. This is true for other subjects taught in K–12 as well, and in my view this reality is one of the important lessons children can and should learn in school. Warm up: can you color the map of Africa with four colors so that no two countries that touch are filled in with the same color? Can you color in the map with three colors so that no two countries that touch are filled in with the same color? The unsolved problem: without trying all possibilities, can you tell when a map can be colored in with 3 colors so that no two countries that touch are filled in with the same color? Background and context: The four color theorem states (informally) that “given any separation of a plane into contiguous regions, producing a figure called a map, no more than four colors are required to color the regions of the map so that no two adjacent regions have the same color.” (from wikipedia). The mathematics statement is that any planar graph can be colored with four colors. Thus, the first part of the “warm up” has a solution; in fact the world map can be colored with four colors. The four color theorem is deceivingly simple- it can be explored by a kindergartner, but it turns out to have a lengthy proof. In fact, the proof of the theorem requires extensive case checking by computer. Not every map can be colored with three colors (for an example illustrating why see here). It is therefore natural to ask for a characterization of which maps can be 3-colored. Of course any map can be tested for 3-colorability by trying all possibilities, but a “characterization” would involve criteria that could be tested by an algorithm that is polynomial in the number of countries. The 3-colorability of planar graphs is NP-complete. Relevant common core: “developing understanding of whole number relationships”. Warm up: Suppose that in a group of people, any pair of individuals are either strangers or acquaintances. Show that among three people there must be at either at least two pairs of strangers or else at least two pairs of acquaintances. The unsolved problem: Is it true that among 45 people there must be 5 mutual strangers or 5 mutual acquaintances? “Imagine an alien force, vastly more powerful than us, landing on Earth and demanding the value of R(5, 5) or they will destroy our planet. In that case we should marshal all our computers and all our mathematicians and attempt to find the value. But suppose, instead, that they ask for R(6, 6). In that case we should attempt to destroy the aliens.” – from Ten Lectures on the Probabilistic Method. Relevant common core: “building fluency with addition and subtraction”. Write out the next row of Pascal’s triangle. The unsolved problem: Is there a number (other than 1) that appears 10 times in the (infinite) Pascal’s triangle? Background and context: The general problem of determining whether numbers can appear with arbitrary multiplicity in Pascal’s triangle is known as Singmaster’s conjecture. It is named after the mathematician David Singmaster who posed the problem in 1971. It is known that the number 3003 appears eight times, but it is not known whether any other number appears eight times, nor, for that matter, whether any other number appears more than eight times. Relevant common core: “(1) developing understanding of multiplication and division and strategies for multiplication and division within 100”. Warm up: Practice dividing numbers by 2 and multiplying by 3. The unsolved problem: Choose a natural number n. If n is even, divide it by 2 to get . If n is odd, multiply it by 3 and add 1 to obtain . Repeat the process. Show that for any initial choice n, the repeating process will eventually reach the number 1. Background and context: The conjecture is called the Collatz conjecture, after Lothar Collatz who proposed it in 1937. It is deceptively simple, but despite much numeric evidence that it is true, has eluded proof. Mathematician Terence Tao has an interesting blog post explaining why (a) the conjecture is likely to be true and (b) why it is likely out of reach of current techniques known to mathematicians. Relevant common core: “Determine whether a given whole number in the range 1-100 is prime or composite”. Warm up: Write the number 100 as the sum of two prime numbers. The unsolved problem: Show that every even integer greater than 2 can be expressed as the sum of two primes. Background and context: This problem is known as the Goldbach conjecture. It was proposed by the mathematician Christian Goldbach in a letter to the mathematician Leonhard Euler in 1742 and has been unsolved since that time (!) In 2013 mathematician Harald Helfgott settled the “weak Goldbach conjecture“, proving that every odd integer greater than 5 is the sum of three primes. Relevant common core: “Graph points on the coordinate plane”. Warm up: A set of points in the coordinate plane are in general position if no three of them lie on a line. A quadrilateral is convex if it does not intersect itself and the line between any two points on the boundary lies entirely within the quadrilateral. Show that any set of five points in the plane in general position has a subset of four points that form the vertices of a convex quadrilateral. The unsolved problem: A polygon is convex if it does not intersect itself and the line between any two points on the boundary lies entirely within the polygon. Find the smallest number N so that any N points in the coordinate plane in general position contain a subset of 7 points that form the vertices of a convex polygon. Background and context: The warm up exercise was posed by mathematician Esther Klein in 1933. The question led to the unsolved problem, which remains unsolved in the general case, i.e. how many points are required so that no matter how they are placed (in general position) in the plane there is a subset that form the vertices of a convex n-gon. There are periodic improvements in the upper bound (the most recent one posted on September 10th 2015), but the best current upper bound is still far from the conjectured answer. 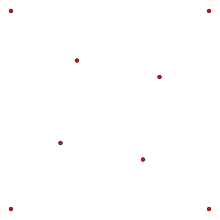 A set of 8 points in the plane containing no convex pentagon. Relevant common core: “Represent three-dimensional figures using nets made up of rectangles and triangles”. The dodecahedron is an example of a convex polyhedron. A convex polyhedron is a polyhedron that does not intersect itself and that has the property that any line joining two points on the surface lies entirely within the polyhedron. 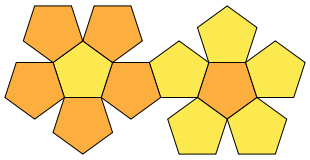 Cut out the net of the dodecahedron (shown above) and fold it into a dodecahedron. The unsolved problem: Does every convex polyhedron have at least one net? Background and context: Albrecht Dürer was an artist and mathematician of the German Renaissance. The unsolved problem above is often attributed to him, and is known as Dürer’s unfolding problem. It was formally posed by the mathematician Geoffrey Shephard in 1975. 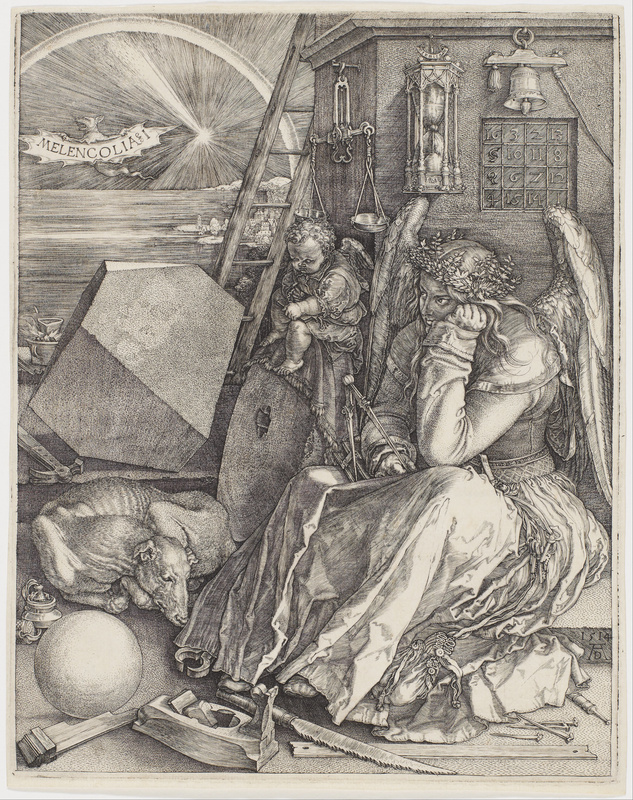 One of my favorite math art pieces: Albrecht Dürer’s engraving Melencolia I. Warm up: Two runners, running at two different speeds and , run along a circular track of unit length. A runner is lonely at time t if she is at a distance of at least 1/2 from the other runner at time t. If both runners all start at the same place at t=0, show that the runners will both be lonely at time . The unsolved problem: Eight runners, each running at a speed different from that of the others, run along a circular track of unit length. A runner is lonely at time t if she is at a distance of at least 1/8 from every other runner at time t. If the runners all start at the same place at t=0, show that each of the eight runners will be lonely at some time. Background and context: This problem is known as the lonely runner conjecture and was proposed by mathematician J.M Wills in 1967. It has been proved for up to seven runners, albeit with lengthy arguments that involve lots of case checking. It is currently unsolved for eight or more runners. Relevant common core: “Know and apply the properties of integer exponents”. Warm up: Show that for any integer n greater than or equal to 1. The unsolved problem: If where A,B,C,x,y and z are positive integers with then A,B and C have a common prime factor. Background and context: This problem is known as Beal’s conjecture (named after the billionaire Andrew Beal). The famous “Fermat’s Last Theorem“, proved via the modularity theorem for semistable elliptic curves, is a special case of this conjecture, an observation that hints at the difficulty of the conjecture. Andrew Beal is currently offering a prize of $1 million for its solution. Warm up: Gaussian integers are numbers of the form where a and b are integers. The norm of a Gaussian integer is . A Gaussian prime is a Gaussian integer that cannot be factored into Gaussian integers of smaller norm. Show that is a Gaussian prime. The unsolved problem: Consider a circle in R2 with centre at the origin and radius . How many points there are inside this circle of the form (m,n) where m and n are both integers. In particular, denoting this number by , find bounds on where . Background and context: The problem is known as Gauss’ circle problem, and while phrased in terms of integer points in the plane, it is equivalent to asking for the number of Gaussian integers with norm less than a given constant. Relevant common core: “Solve systems of equations”. and . Verify that (a,b,c,d,e,f) = (85, 132, 720,157, 725, 732) is an Euler brick. Is there a perfect cuboid? Background and context: The existence of perfect cuboids requires solving the systems of equations for the Euler brick with the addition of the requirement that with g an integer. The solution of (non-linear) systems of equations in many unknowns is the subject matter of algebraic geometry, in which a bridge is developed between the algebra and a corresponding geometry. Generally speaking the equations are easiest to solve when the solutions can be complex, harder when they are required to be real numbers (real algebraic geometry) and hardest when they are constrained to be integers (Diophantine, or arithmetic algebraic geometry). Relevant common core: “Understand the concept of a function and use function notation”. Warm up: Euler’s totient function denoted by assigns to each positive integer n the number of positive integers that are less than or equal to n and relatively prime to n. What is when p is a prime number? The unsolved problem: Is it true that for every n there is at least one other integer with the property that ? Background and context: The question is known as Carmichael’s conjecture, who posited that the answer is affirmative. Curiously, it has been proved (in The Distribution of Totients by Kevin Ford, 1998) that any counterexample to the conjecture must be larger than . Yet the problem is unsolved. Warm up: Read the biology paper The Biological Underpinnings of Namib Desert Fairy Circles and the mathematical modeling paper Adopting a spatially explicit perspective to study the mysterious fairy circles of Namibia (some basic calculus is required). The unsolved problem: Develop a biologically motivated mathematical model that explains the fairy circles in Namibia. 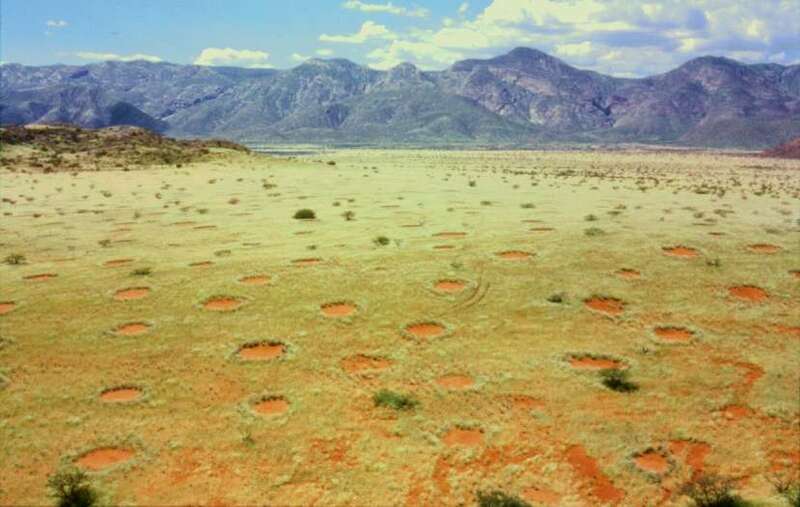 Background and context: Fairy circles occur in Southern Africa, mostly in Namibia but also in South Africa. The circles are barren patches of land surrounded by vegetation, and they appear to go through life cycles of dozens of years. There have been many theories about them but despite a number of plausible models the phenomenon is poorly understood and their presence is considered “one of nature’s great mysteries“. Relevant common core: “An understanding of the attributes and relationships of geometric objects can be applied in diverse contexts”. Warm up: Calculate the area of the handset shape shown moving in the figure below. It consists of two quarter-circles of radius 1 on either side of a 1 by 4/π rectangle from which a semicircle of radius has been removed. The unsolved problem: What is the rigid two-dimensional shape of largest area that can be maneuvered through an L-shaped planar region (as shown above) with legs of unit width. Background and context: This problem was posed by Leo Moser in 1966 and is known as the the moving sofa problem. It is known that the largest area for a sofa is between 2.2195 and 2.8284. The problem should be familiar to college age students who have had to manouever furniture in and out of dorm rooms. Warm up: A family of sets is said to be union-closed if the union of any two sets from the family remains in the family. Write down five different examples of families of sets that are union-closed. The unsolved problem: Show that for any finite union-closed family of finite sets, other than the family consisting only of the empty set, there exists an element that belongs to at least half of the sets in the family. Background and context: The conjecture is known as Frankl’s conjecture, named after the mathematician Péter Frankl, and is also called the union closed sets conjecture. It is deceptively simple, but is known to be true only in a few very special cases.